The Matias Family: Happy New Year! Feliz Ano Novo! 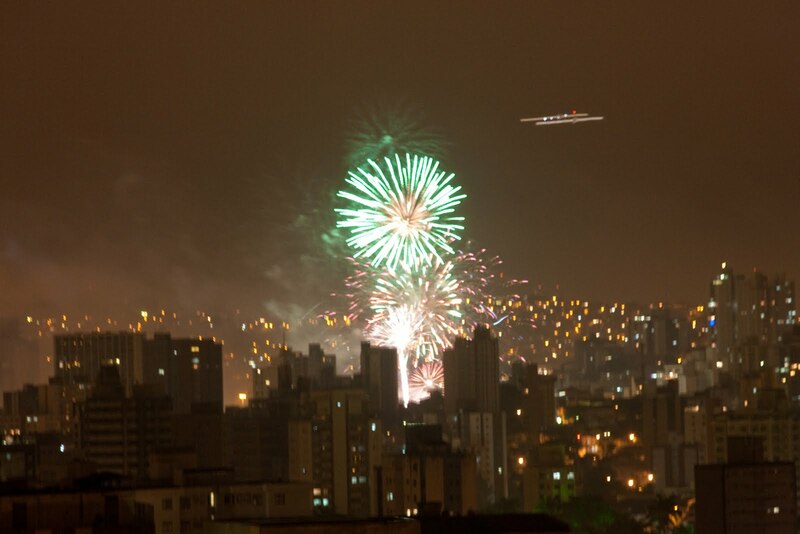 New Year's is quite an experience in the city of Belo Horizonte, Brazil! 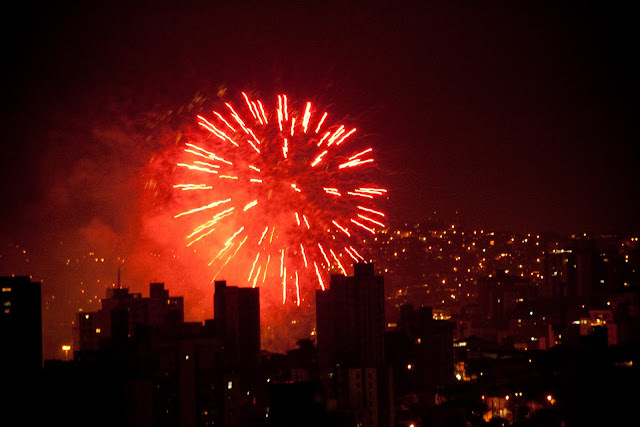 There are lots of fireworks, and not just at night. 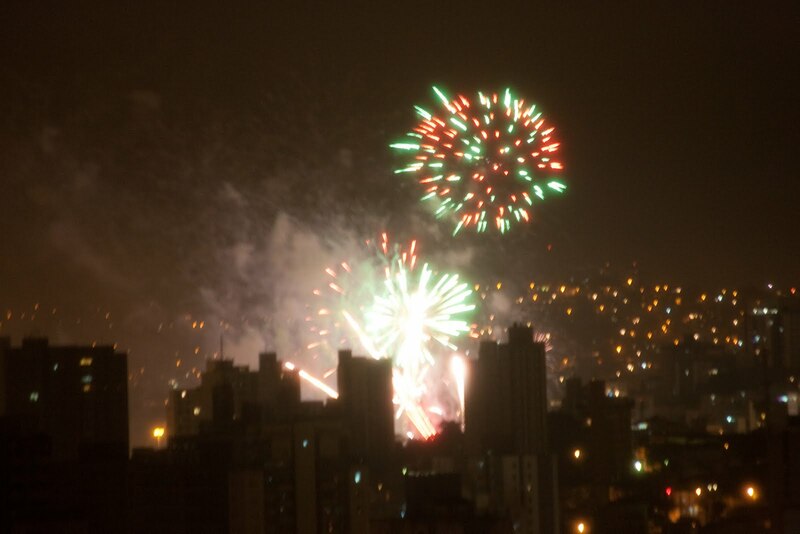 Fireworks were sounding throughout the city all day long yesterday... Yes, I did say all during the DAY. People start their celebrating even during the daylight! The Lighthouse Community Center is located on a mountain and we have an amazing view of the city. 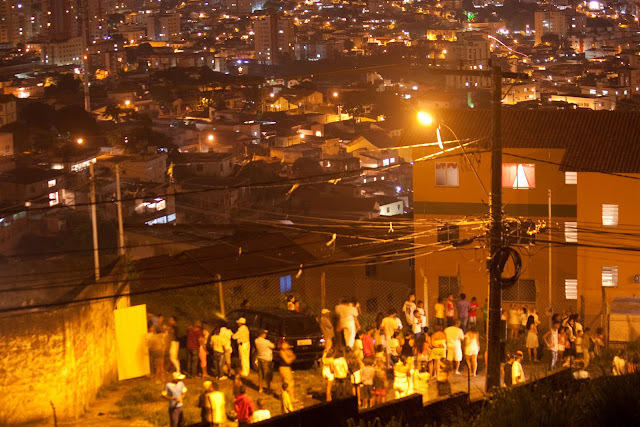 Last night we all gathered to look out over the city to see the fireworks people were setting off from their homes and also the more official fireworks being set off from different points in the city . Late at night, the fireworks increased in intensity. At about 11:40 pm the noise was so loud it almost sounded like we were in a warzone. 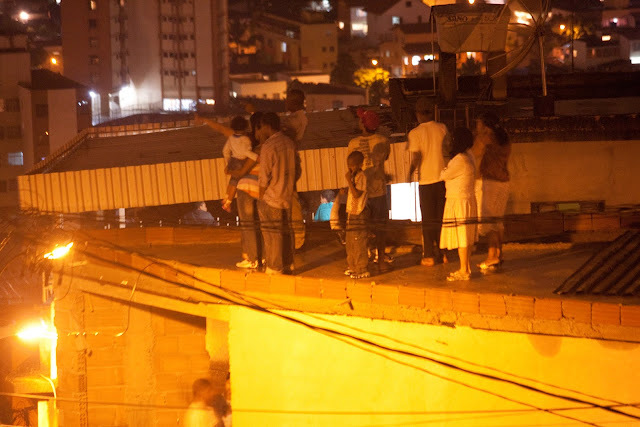 Many people in the slum specifically set off a firework that just makes a loud popping sound, so it was super loud here! 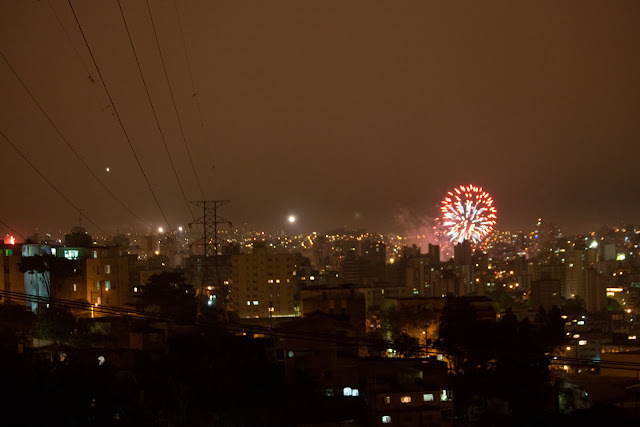 It was an amazing sight though, looking over the city and seeing the colorful flashes of lights. Felipe took some cool photos with his nice camera. Many people from the slum were standing on rooftops and in the streets to see the fireworks over the city. Felipe was having fun playing with his camera. NEW people for the NEW Year! Yesterday, a group of new people arrived here just in time for the New Year! A team of 8 people (from the UK, Germany, Holland, USA, and Finland) arrived from a Youth With A Mission (YWAM) base in England. The team will be here with us for 2 months doing their Discipleship Training School (DTS) missions outreach phase working together with the Lighthouse team. 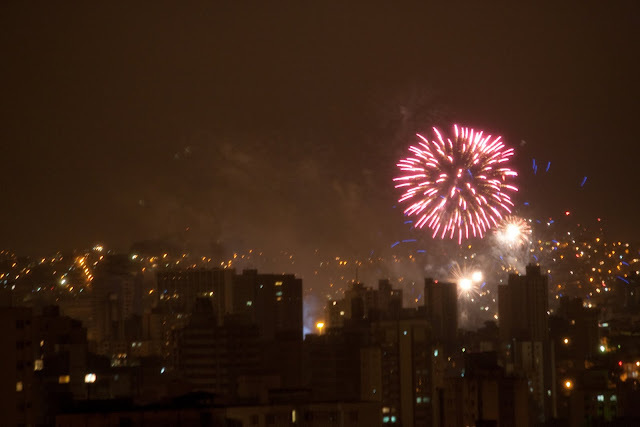 Before the late night fireworks we celebrated the New Year with food and games. 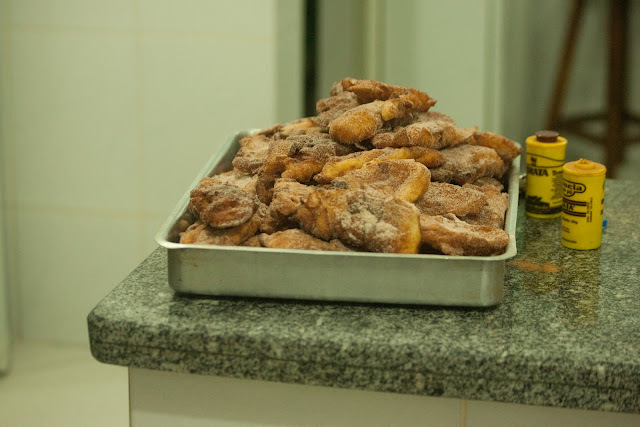 Here is a special food called rabanada that Andreia (a Brazilian team member) made. She loves to eat this to celebrate the New Year so she made this to share. It is kind of like french toast and very yummy! Then we played several games! My favorite game was like a scavenger hunt game - that is a bit difficult to explain but was super fun to play. Everyone was running all over the Lighthouse searching for pieces of paper with the names of international airports written on them. 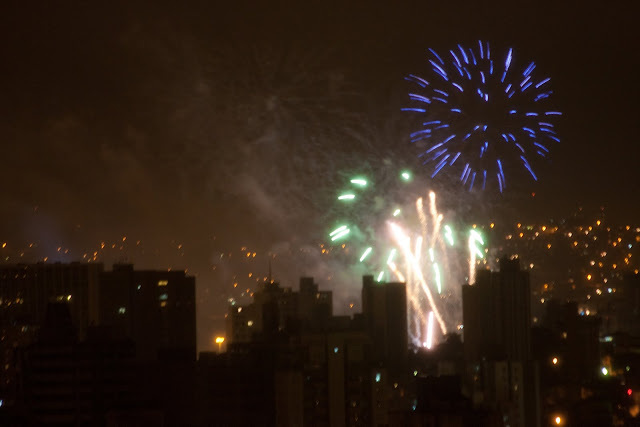 Wishing you a HAPPY NEW YEAR from BRAZIL! We are thankful for so many blessings that happened in 2010. We really have so much to celebrate in this life! God pours HIS love, mercy, and blessings over us all each day. Looking forward to the NEW adventures the Lord has for us in this New Year of 2011.